Beautiful and good quality product! Very cute and heavyweight. I'm looking forward to completing the set for my bathroom with the rest of the accessories. The price was a great deal with Overstock coupons and with the reward points. I recommend it. 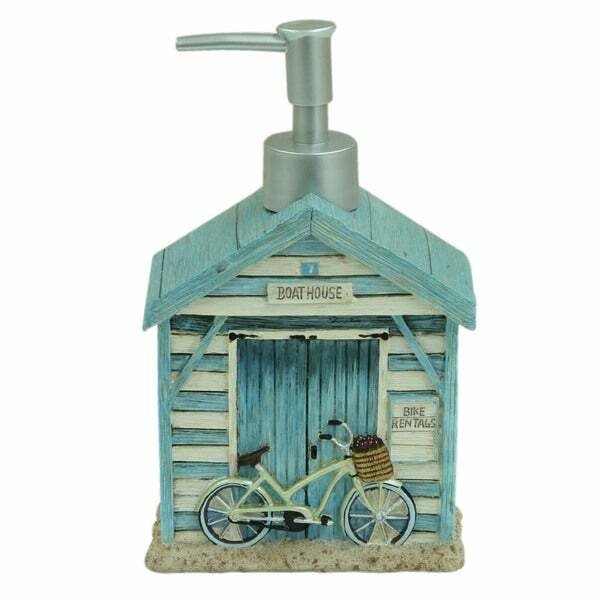 Bring a rustic seaside look to your master bath with this beach cruiser lotion/soap dispenser. The hand-painted design offers a whimsical look, and the hand pump makes it easy to dispense your favorite soap. This Beach cruiser Lotion/Soap dispenser adds a touch of character to the whole design, well made, wonderful colors. Love the beach bike on the front! I love this dispenser, I actually use it for lotion in my guest bathroom. This line is so cute, I love the classic beach cruiser look that it has. It looks perfect with my coastal decor. I would totally recommend this it is made really well. In fact it’s even a little heavy. I consider this a good thing, as it won’t tip easy. This soap dispenser is so whimsical and the colors in the picture are true to the colors you see in person. I love it and it makes me smile every time I see it next to my kitchen sink. This is a very high-quality product. It has a nice weight to it. It is secure sitting on the sink. The detail is amazing. It’s cheerful for the summer months. I find it changing out little things Such is a soap dispenser is a refreshing idea. I brought 3 of these recently. They seem very sturdy, nicely made, cute color and good size. I also got them while they were on sale which was a great deal. Just beautiful!!! So happy with the quality of the product. It's really cute and I really like the colors. The only thing that concerns me a bit is the handle &amp; top are plastic. As long as it holds up okay, it's all good - only time will tell. Overall, great design!